As I gear up to relaunch Pots & Plans this Fall, I’ve been branching out and trying new recipes and flavor profiles with a focus on dishes that include vegetable-heavy portions or pair well with an easy vegetable side. As a result, I’ve also been spending more per week on our groceries, buttttt I’ve been thrilled with what’s ended up on the table. I primarily use Safari as an internet browser (I know, I know, Chrome is better, blah blah blah whatever). I do my recipe searching in multiple tabs… each tab has a different food blog or food site open, then I open each recipe I’m interested in in another new tab (soooo I have approximately 57 tabs open at any given time. David hates borrowing my computer because this mode of “organization” stresses him out… sorry, buddy). Thennnn I open a Google Chrome window and after reviewing the Safari recipes, I move the recipes I’d like to eventually make into tabs within that window. As I cook them, I move them into a secondary Chrome window and separate tabs in there until I save them or blog them. As I type it out, it seems like a horrifyingly bad system. But, guys, it works for me. ALSO: BREAKING NEWS! Per the news, Aldi is adding curbside pick up soon, and very little outside of my children has ever made me so excited. Chocolate Macaroon Cake – I had never intentionally made a gluten free dessert, but I made this cake for Jane Ellis’ baptism to accommodate one of our friends. I will certainly be making it again… and soon. Lemon Ricotta Pancakes – My girls love citrus (lime yogurt is a favorite in the house), so I knew they would love these. I studded half the batch with blueberries, and we’ve been working through them all week. Chocolate Chip Cookie Dough Lara Bars – these bars were a pretty quick and very easy snack to have on hand this week, plus the food processor does all the work. I prefer them straight out of the freezer than the fridge. And I found a huge bag of dates at Costco for $8. Homemade Lemon Pie Lara Bars – again with the citrus love. I made these immediately following the chocolate chip version using nuts that I had on hand (a mix of cashews, pecans and almonds). Maple-Cinnamon Oatmeal Breakfast Bars – These were a quick and easy option. Espresso Chocolate Truffles – My mom’s and my birthday are two days apart, and she had a ginormous almond cake made for mine. By her day, we were pretty overcaked, but I still wanted to make a treat for hers. Enter these truffles. Even as a non-coffee partaker, I loved them. Chicken Parmesan Pappardelle – I threw this together post-baptism, and David immediately requested that it be added to our frequently-made rotation. Healthy? Nope. Delicious? Most certainly. Additionally, this came together in less than 30 minutes. A Warm Pan of Chickpeas, Chorizo, and Chevre – I was intrigued by the title of this recipe moreso than I was convinced that it would be delicious. But color me shocked that it truly was excellent. Add this to the list of meals that take less than 30 minutes, and I was extra surprised when Annablair and Nora Beth each ate about half of the bowl I prepared for them. They lost interest after that, and instead polished off their shrimp and tortellini, but I consider it a child-friendly win. It also reheated well for lunch the next day. Easy Lemon Chicken Piccata – this a staple in our house. David loves it, and I do too. I’ve shared it before, but since I made it recently, it was worth re-sharing. Cheeseburger Salad – a quirky salad that we enjoyed but is definitely best day-of. Braised Moroccan Chicken – The flavor combinations here made for a really scrumptious dish that the girls enjoyed too. Nashville Unfried Hot Chicken – I posted this in my last recipe round up with a note that I’d be making it again soon. I am so glad when I prove to myself that I don’t lie. 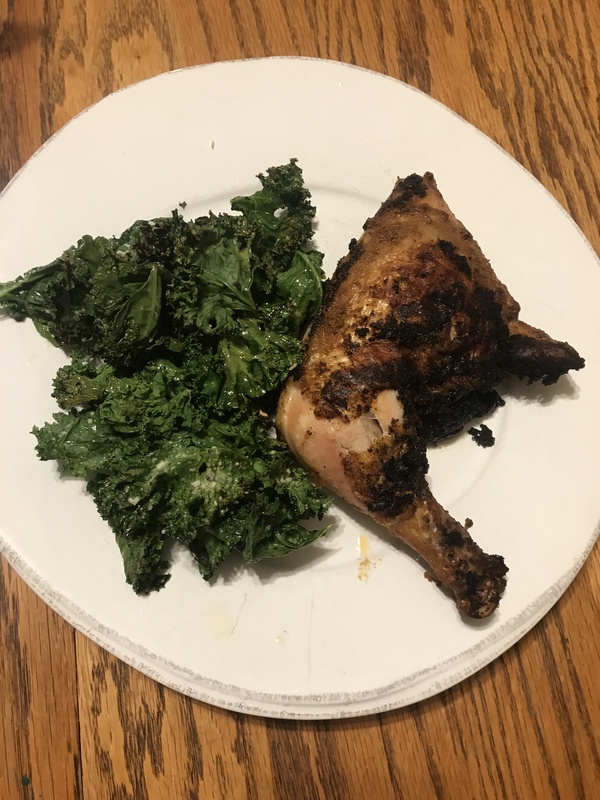 Perfect Roast Chicken – Though I really don’t like Ina (sorry, world… also on the list: Justin Timberlake), everyone needs this recipe as a staple. Short Rib Pot Pie – I made this for my mom’s birthday dinner, and we all LOVED it. I grabbed boneless beef ribs from Aldi, and they were really great. I actually had enough filling for two pre-made pie crusts and ate it all week. It reheated perfectly and was exceptional served with roasted broccoli and mashed potato pancakes. Sausage Egg Roll in a Bowl – There are only about 1 trillion recipes out there for egg roll in a bowl, but this is the one I love. Chicken Bryan Pasta Skillet – one of David’s all-time favorite meals. Steak and Tabbouleh Salad – I’d never made tabbouleh before, but this won’t be the last time. I loved using the bulgur wheat, since I’m a fiend for different types of grains. Best Anytime Baked Chicken Meatballs – If you have littles, I highly recommend keeping a batch of these in the freezer. They are delicious, versatile, and a crowd pleaser. Greek Lamb with Orzo – Make this soon. And use any ground meat you prefer. I love lamb but made it with ground beef.